Do You Know Someone In Need Of Psoriasis Treatment? Many people are looking for a natural psoriasis treatment as well as psoriasis herbal remedies. I tell people first, know that psoriasis is actually a very common skin disorder. Over 7 million people in the United States have it. So most of us know someone that has this condition and needs a psoriasis treatment. 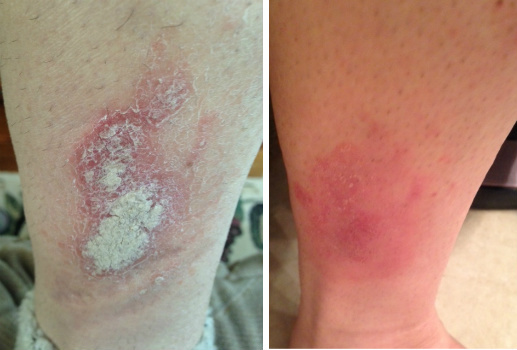 Many searching the web are asking, "What does psoriasis look like and do I have it?" To begin with, this skin condition affects your skin by causing thick red , silvery scales and flaky skin patches to form causing sensitive skin. Sometimes pus-filled blisters form. Most of the time, the skin on the elbows, knees and feet is affected, but a rash can occur anywhere on the body, including the scalp, fingernails and ears, and even the skin over the joints. You can keep a daily journal of the condition of your skin and what symptoms form in order to determine if you have the beginnings of psoriasis. Many people wonder what causes psoriasis. As frustrating as it can be, no one knows exactly what causes it. It's not caused by something you ate or something you're allergic to. The reason your skin becomes thick and red is that the skin cells are growing faster than normal. Because of their rapid growth, there isn't enough time for the cells to shed (fall off). As a result, the cells pile up on top of each other, making thick, scaly patches on your skin. In mild cases, a few areas are affected; in severe cases, it can be over your whole body. It can get better or worse but a proper psoriasis treatment can bring incredible relief to you or a loved one. I frequently get asked if psoriasis is contagious. Men, women, children and people of all races can get it, but it is not contagious therefore, you can't catch it from another person or give it to someone by touching them, and you can't spread it to other parts of your body. Simply, anyone can get this disease. Know that the disease sometimes runs in families. If unsure, check with those in your extended family tree. I also get asked, "What makes this skin problem worse?" Some things that can make it worse are stress and infections. Some medicines can make it worse, too as well as pain relievers like some non-steroidal anti-inflammatory drugs. 1) One free thing to do is simply to be in the sun. Sunlight can help some, but be careful not to over do it. A sunburn can make your problem worse. 2) The next helpful recommendation for your psoriasis treatment care is to include "green" skin nutrition as well as omega 3 oils in your diet. Countless studies show that increasing the consumption of chlorella, spirulina and omega-3 oils improves conditions of psoriasis, eczema as well as other types of dry, rough, red and scaly patches of skin experienced by so many. 3) Wash with a specially formulated mild "non-soap" cleanser , that contains only herbal ingredients that are organically grown and hypo-allergenic. Vitamin-derived antioxidants from plant sourced ingredients not only make the best ingredients for your "inside", but for your "outside" as well. A pure and gentle cleanser will be just right for a psoriasis treatment. 4) The last, but extremely important psoriasis treatment is to apply a therapeutic moisturizer that is hypo-allergenic. Unfortunately, it is difficult at best to find a product that can effectively hydrate and repair the skin. I encourage my customers to become "label readers" as this is vitally important. Choose only a specially formulated therapeutic body cream for the much thicker patches psoriasis often forms. It should be a very thick cream with a very rich emollient level. It should also contain the vitamins C, A and E as well as soothing Chamomille, Comfrey and Calendula Herbal Extracts and Shea Butter . These prime ingredients have a great therapeutic effect on skin restoration. For those of you who have psoriasis on the scalp, face or torso, choose specially formulated products for those areas as well. 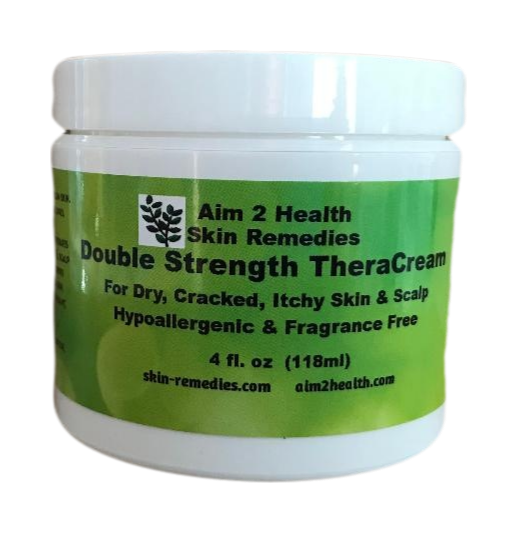 The #1 most important factor about a natural therapeutic skin cream is that it has the capability to penetrate not only the thick scales of your psoriasis, but also penetrate the 7 layers of skin . This is crucial to getting "deep down" relief and resolve for a psoriasis treatment. The ingredient urea provides this important feature. The dry scales should improve almost immediately after you begin your psoriasis treatment with the right products. For a few, it may take several days to several weeks for the affected areas of your skin to return to a more normal thickness. As an important note, you must be consistent and diligent. Psoriasis will improve since the body responds to natural, plant based remedies quite well. I have seen young and old get relief with the right specially formulated products for psoriasis treatment. Letters to Nanette: I am 60 years old and I had been going to the same dermatologist for 35 years when I came to see you. You asked me why I kept going to the same doctor for so many years without any relief and I told you, "Because I HOPED that someday, something would work!" You looked at my caked up psoriasis on my elbows and knees and recommended the non-soap cleanser and the Double Strength TheraCream. Below you will find links to the natural products I recommend that, in my professional opinion, work BEST for psoriasis treatment and care.